Planning, it is such a HUGE world it can be incredibly overwhelming. 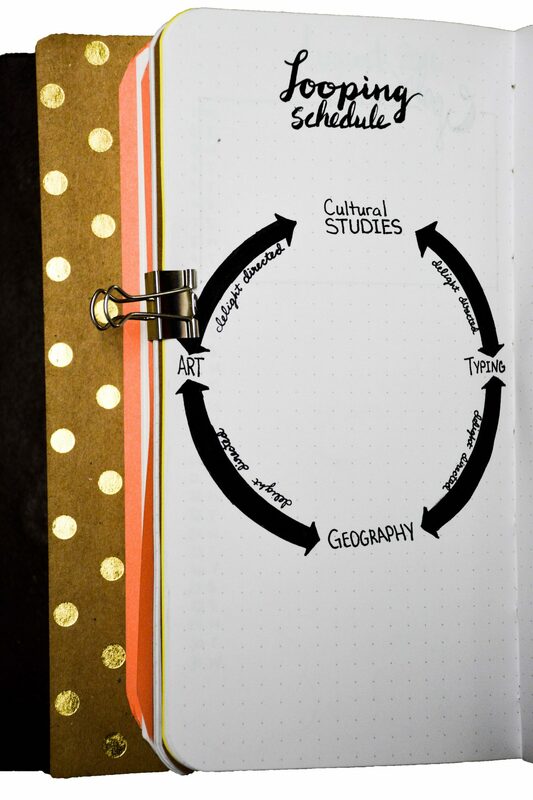 There are so many planner options out there, but it can be difficult to find what will work for you, especially if you are new to homeschooling or looking for a new planning method. I can’t tell you what will work for you (sorry guys), but I can share what works for me, explain why, and share lots and lots of photos to hopefully inspire you and spark your imagination. I can promise you that my planning system is unique, something you haven’t ever seen before, because I make it myself. If you follow my blog, you might know that I am addicted to bullet journaling. 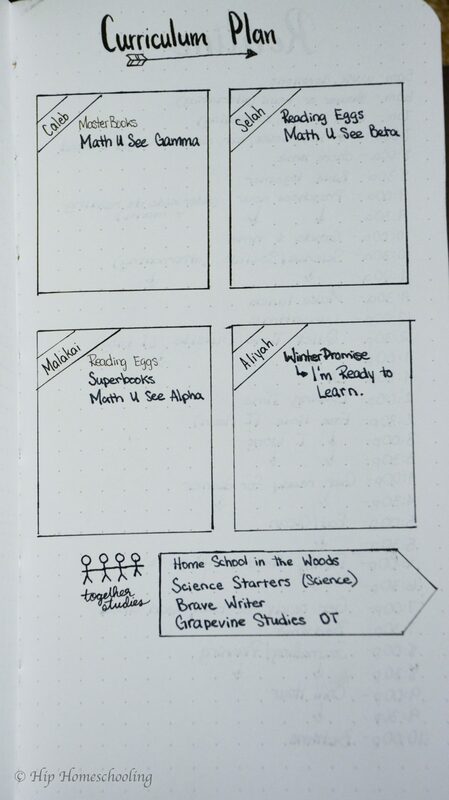 I have recently decided to add a homeschool bullet journal and had a ton of fun setting it up these last few weeks. There are a lot of planners out there. 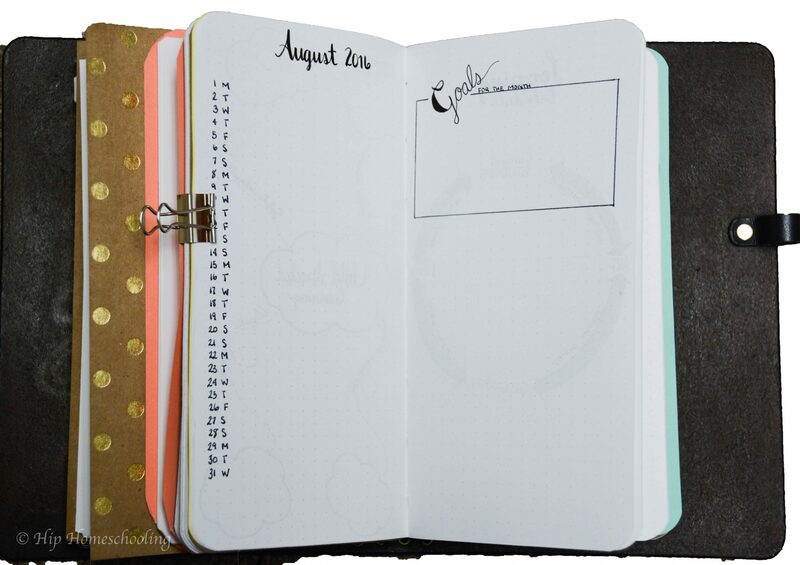 Some specifically designed for homeschooling, a lot of people use their Happy Planners or Erin Condren’s for homeschool planning, but traditional planners never worked for me. They never include what I want, they aren’t tailored to suit my taste and needs, and they have all these pretty boxes that I inevitably fail to fill and then want to toss the whole system because I am a DIEHARD perfectionist (think all or nothing people!). I stumbled upon bullet journaling (I actually can’t remember how I first heard of it) and fell instantly in love! I was all in! I bought a custom Traveler’s Notebook (get yours here), made my own inserts (available here), and was ready to plan my life, MY way! There are so many different approaches to bullet journaling, it can seem overwhelming to begin with, and I spent the good first half of this year just becoming familiar with the basics and figuring out how to make it work for me. I did whole months filled with water color and stickers and colored markers. Eventually I realized that the key to this being a long-term solution for me, was simplicity. So I went a little more minimalistic in my approach. I found a simple black felt-tipped marker and made myself some really easy dot-grid inserts and went searching through Pinterest (see my master BUJO board here for inspiration) to find the best of the best for layouts that didn’t take too long to set up, were functional, and customizing them to my family. Because I use a Traveler’s Notebook (TN) and different inserts (I have 10 inserts right now) I am able to have one separate notebook for each area of my life. I love how it makes everything that much easier to find, I chose different colors and paper for the covers of each notebook so it is REALLY simple to just flip through to my collections insert, meal planning insert, monthly insert, weekly insert, budget insert, prayer request insert, journaling insert, or homeschool insert (to name a few). Once I open it to the right insert, I can set it up the way I want to in that area. I set up a collection insert in the very front of my TN for planning pages that are more useful that I want to refer to long term. For example my cleaning schedule, my phone numbers list, important dates tracker, memories, etc. Now that you understand my planning background and system, it’s time for the fun stuff, seeing how I set up my homeschool bullet journal. First of all, because of my extreme perfectionist tendencies, I am careful what I plan and how far in advance I plan. I find that it is helpful to plan big picture ideas, curriculum, routines, and brainstorming, but the rest of my planner is more for record keeping and I only fill up my lesson planner once a week. My first page is an index, so that I can easily find all the pages and collections in my homeschool bullet journal. It is simply a page for me to reference regular information that I might want to find. I set this up by hand (as you can see by the minor imperfections on the side). Next I have our website and password tracker. This is not just general passwords or websites that I use everyday, but rather ones specific to our homeschooling. For example, we will be putting in Reading Eggs log in info for each child, Veritas Press, our Spanish program, etc. I am constantly looking in my emails to find everyones log in info, NO MORE! 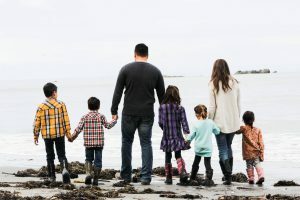 Plus, my kids are always free to look through my TN and find their own log in information as well, the sites are bookmarked on the computer and as long as they have their log in, they can be pretty self-sufficient in this area. Next I have my favorite collection so far, I didn’t come up with this idea, it is taking the Pinterest world and Bullet Journal world by storm: the “Books to Read” collection. But I LOVE it! I am going to write on the spines of these books which books we want to schedule for our read alouds either in our morning basket (still not sure if I am going to try that or not) or before bed. So far we have Anne of Green Gables and Pippi Longstocking on there but I have a whole bunch more to write in! 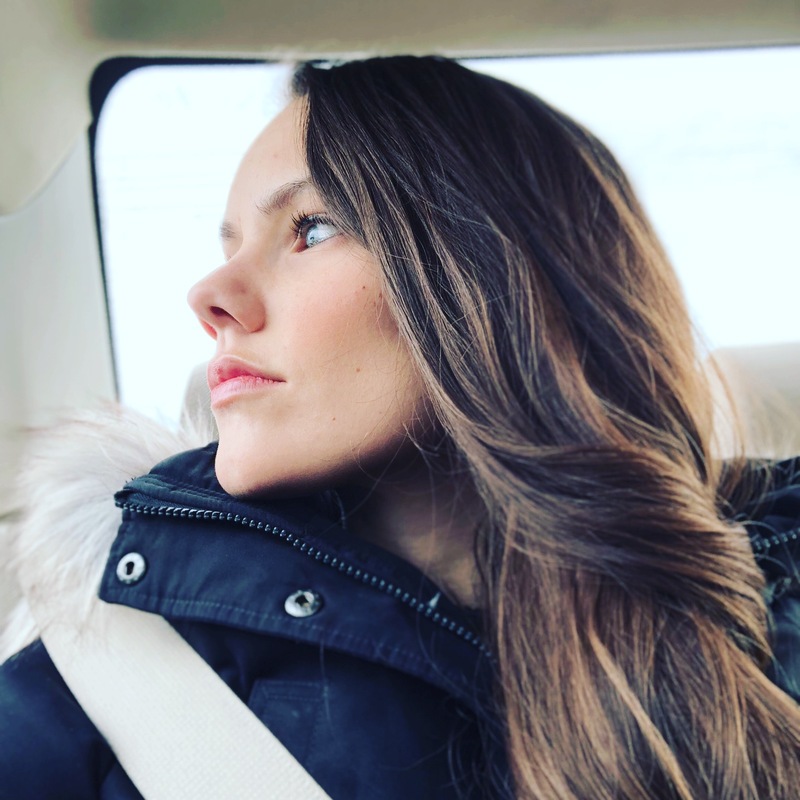 Stick with me… we are about halfway through! Next I set up my curriculum plan. I set it up with each child having their own box to plan what we are using individually as well as for group learning. There is lots of space to change this through the year as well. I love setting up my routine and I did this one a bit differently. Though I DEFINITELY don’t stick with this, it gives me something to refer to on days I just need a detailed plan. If you can read it, you’ll notice there is a block of time for looping… stay tuned. Whew, you still with me? 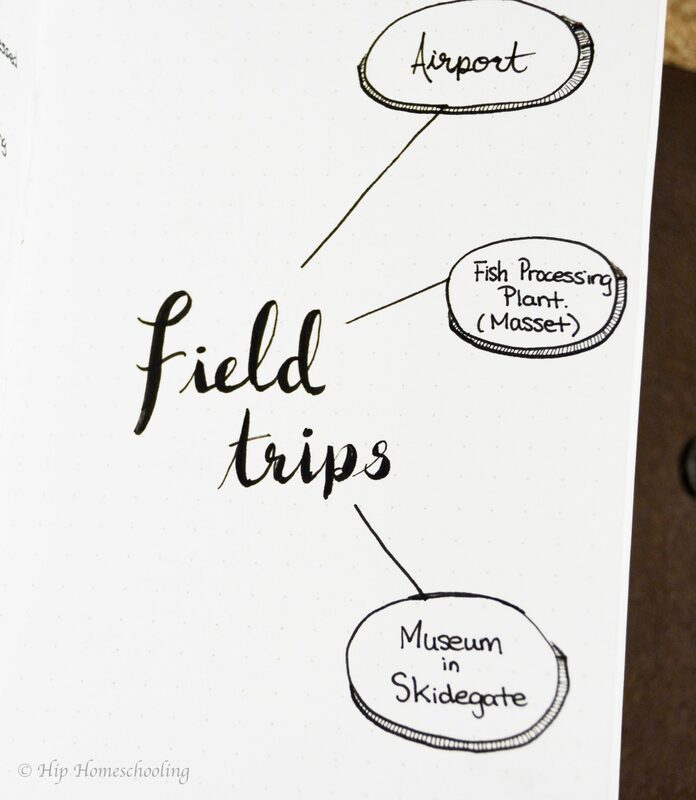 I wanted a page to create a bit of a plan for our field trips for the year, or at list trips I want to look into to see if they are possible. This is a super simple collection (all of these are pretty simple, I only spent a few hours setting all this up for the year). Now I needed to keep track of what supplies we need throughout the year. I wanted to have a place to just make a shopping list, but more importantly, I wanted it all in one place. I plan on putting little boxes here for each “order” I put in at Staples, I am hoping it will help me figure out a budget, how much we spend, and what we generally use through the year so I can bulk order in the future. I also set up a page for child-directed learning. This is basically how I am blending in unschooling with our homeschool days. 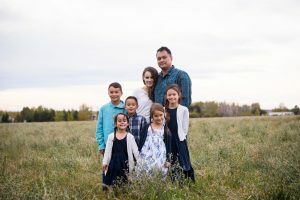 I want to make sure that my kids are learning about what they are interested in and will be trying to tailor their education, reading times, and more based on their interests. I plan on having a fun little coffee date with each child to talk about what they are interested in learning about once each term. 2 more you guys! And we are officially through my yearly planning materials! 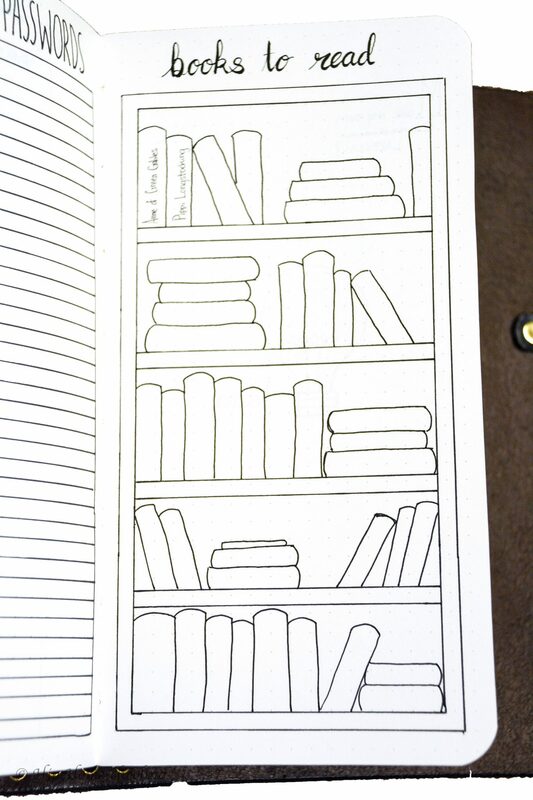 Next I have a two page spread that I will be using for my monthly planning, I still have quite a bit of room and am still thinking on how I want to use that up, but basically it is NOT for planning! Instead, I want to use this as record keeping. Planning is just a recipe for my perfectionist little brain to feel overwhelmed, discouraged (because I fail… a lot), and stressed. Record keeping I can do. My goal is to write down one thing that we learned that day, even if it is just in normal life. Okay, we went to the beach, on the way we talked about the Haida Culture and we went berry picking and chatted about plants and the First Nations People here and how they would have had to live on that. Boom…. cultural studies, social studies, and environmental studies. Not to mention PE! And we’re back to cultural studies! So rather than putting in my planner that Monday is for cultural studies, I would just look at my loop and figure out what came next. It is an amazing way of making sure that extra stuff get’s done, without it being concrete where you miss it and then who knows when you’ll do it next! I have to be honest, homeschool bullet journaling is new to me, I don’t know exactly how I’ll do it. I will for sure do a monthly page to track goals and keep record of what we are learning. But aside from that, I am not sure. 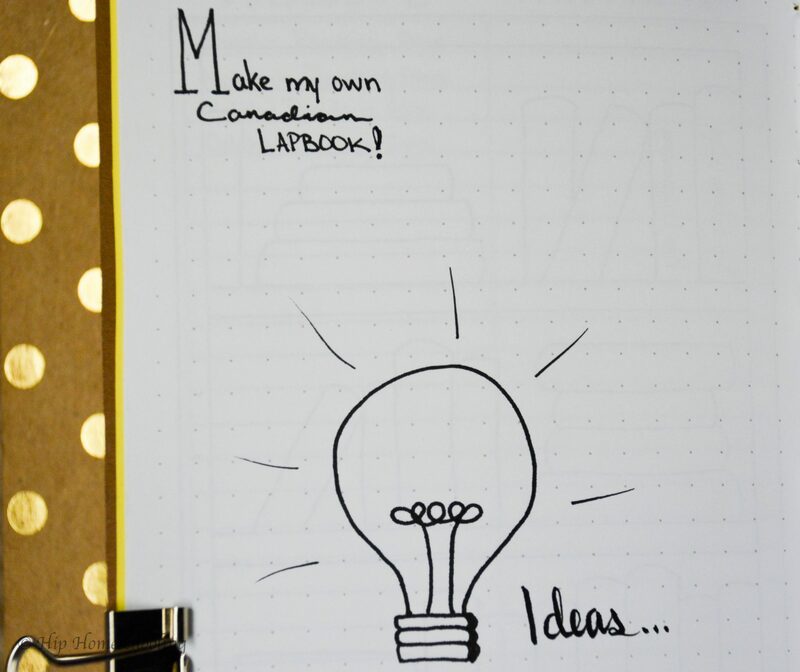 I have a feeling I want to keep it less rigid and more of just a planning notebook in general. So for example, we are planning a fun weather science unit, maybe I’ll just take an evening with my homeschool BUJO and plan what that will look like, what I need to buy, what the days will look like, etc. 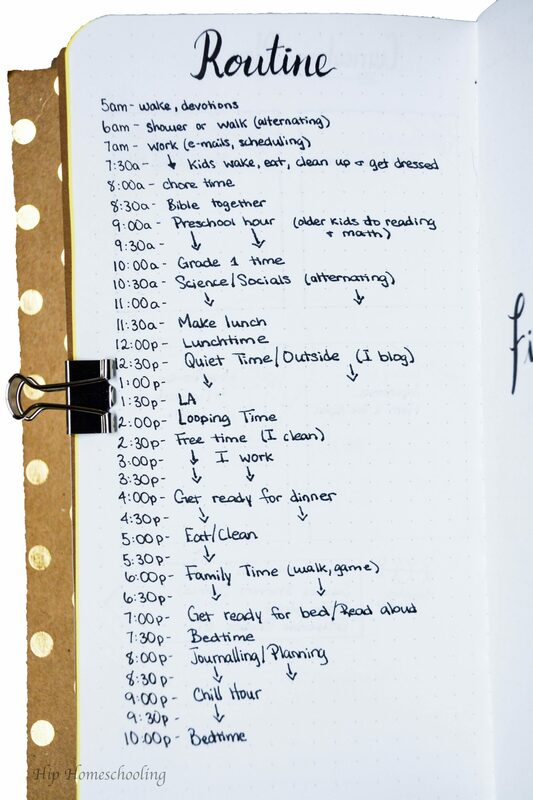 I think this might work better for me than daily planning. Maybe one week we have a lot to get done and I need to see it all laid out (I am totally a visual learner), and then maybe the next week we fly by the seat of our pants and I do nothing! The freedom of the bullet journal is that there is no box to fill, not requirements, no missing pages, it can be whatever I need it to be! I will do more updates through the year as I get more familiar with my homeschool bullet journal and share pictures and insight as to what is working and what we are tweaking moving forward, so stay tuned and make sure to join my newsletter so you don’t miss it! 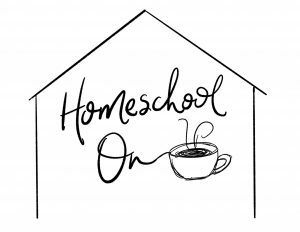 You can also follow me on Instagram for updates, photos, and just bits and pieces of our daily homeschool life, as chaotic and unplanned as it may be! 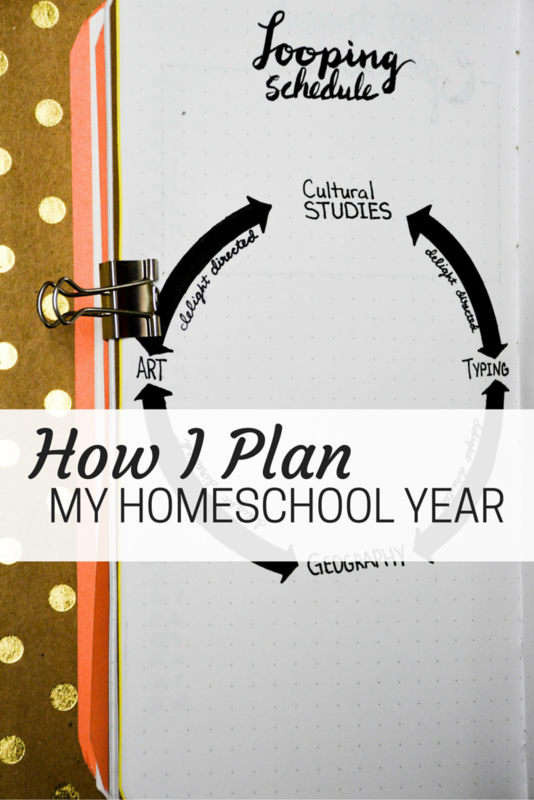 How do you do your homeschool planning? 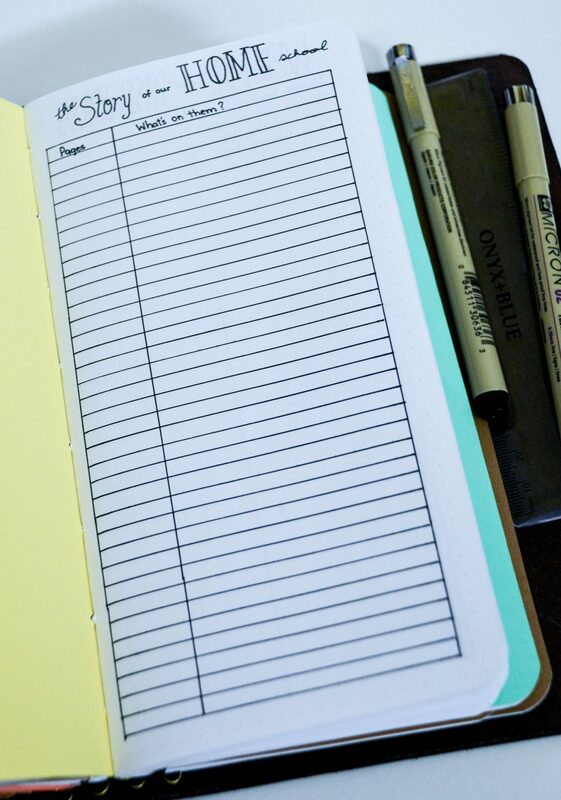 What size bullet journal did you choose? I need the same amount of inserts and Love your cover,but didn’t see what size I should order ? it is amazing how things just come together on the internet. 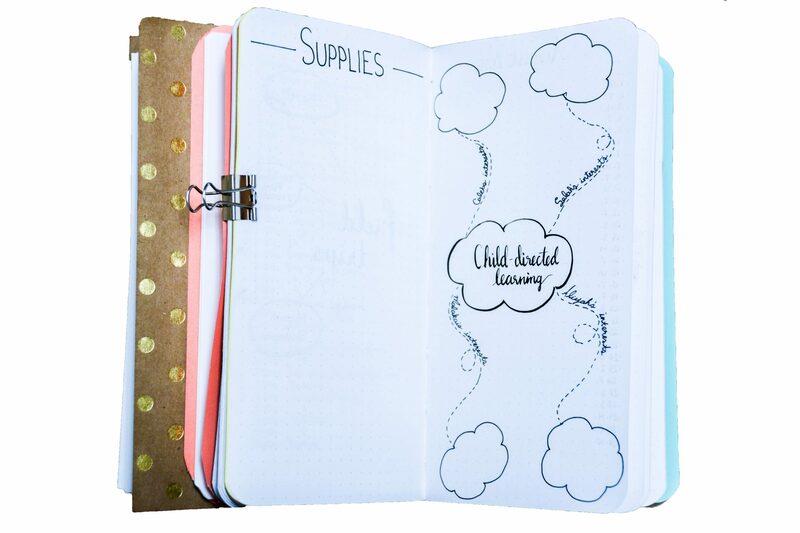 I have just been looking at a Midori style journal system for housework planning, homeschool planning and organising but hadn’t seen any homeschoolers using the TN the way I use my current journals. Then I go blog hopping about organising school rooms etc and I come across your blog. 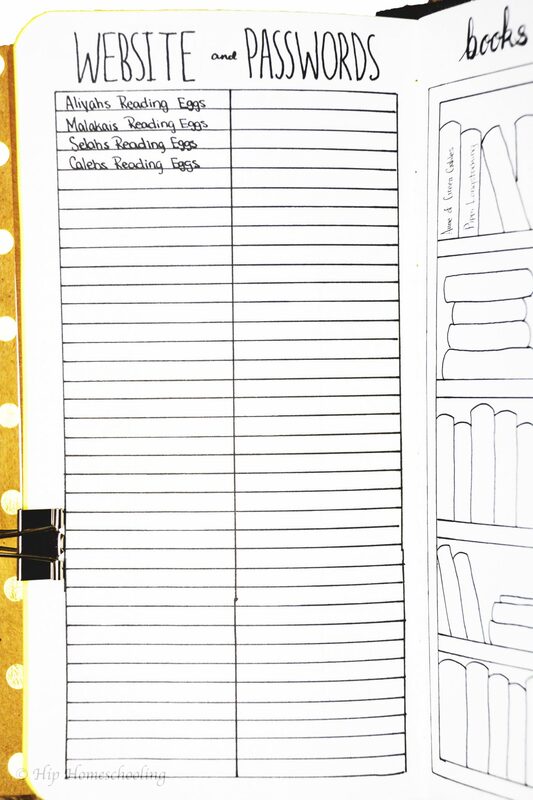 Right here just when I need it someone is showing me how to use a Midori style journal for homeschool planning and record keeping. Awesome!! I will be following to see how you use it for this coming year. I loved this article! I am very similar to you – a perfectionist that needs every box checked. I hadn’t been on Pinterest for a while but last night when I discovered bullet journaling I got on Amazon and ordered a journal right away! It comes tomorrow and I can’t wait, I already have so many good ideas! 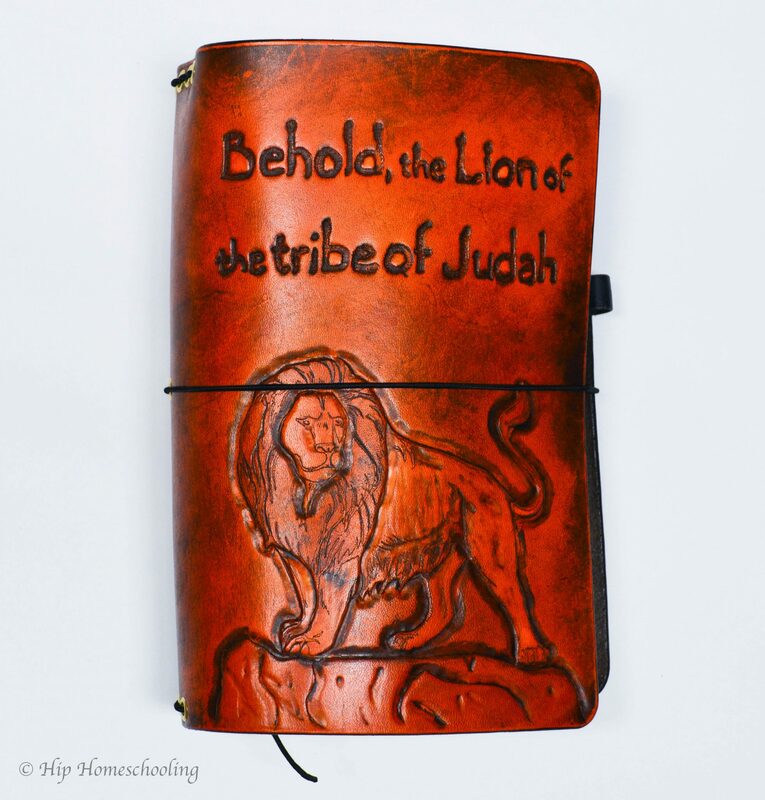 It feels like I will need a whole separate one for my homeschooling though, what do you think? Thanks for sharing all your awesome ideas! This is great! Right now I have a simple system with a binder for me (tracking, scope & sequence, worksheets) and while it’s functional there’s not really a way for me to plan things out or develop a schedule. I only have two young kids, so less pressure now, but I think something like this could be a good long-term plan for handling things. I especially like the idea of having a books to read ans ideas section! I read much less for myself, and then when it comes to picking books for the kids I forget titles as soon as I learn about the great new book we should try. 😅 Thanks for sharing.